It’s a great time to be alive for Star Wars fans. Between canon sequels like Star Wars: The Last Jedi and standalone movies like Rogue One, Disney is pumping out a new movie every year, whether audiences want them or not. This year’s offering is the origin story for which fans have been clamoring for years: Solo: A Star Wars Story. Just as the title suggests, Solo: A Star Wars Story is all about Han Solo, played by Alden Ehrenreich from Hail, Caeser! and Stoker. The movie begins with his escape from the planet Corellia, where he grew up as a street kid. Circumstances forced him to leave his childhood girlfriend, Qi’ra (Emilia Clarke from “Game of Thrones”), behind, but he vowed to return for her. This vow takes him on further galactic adventures which find him teaming up with a smuggler named Tobias Beckett (Three Billboards Outside Ebbing, Missouri‘s Woody Harrelson) to perform nefarious deeds for a criminal leader named Dryden Vos (Paul Bettany from Avengers: Infinity War). 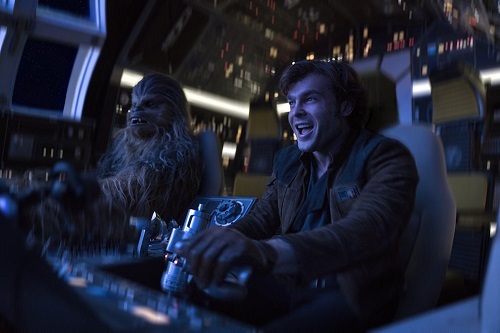 Along the way, Han also meets the Wookiee Chewbacca (Joonas Suotamo, the heir apparent to the master Peter Mayhew), who would become his best friend and sidekick, as well as gambler Lando Calrissian (The Martian‘s Donald Glover), from whom he would eventually win his prized starship, the Millennium Falcon. None of this spoils anything, because most of that synopsis is common knowledge in the Star Wars universe. The fun in Solo: A Star Wars Story is not how things inevitably wind up, but how it all gets there, and the movie is full of twists and turns, with double- and triple-crosses to spare, all of which keep the audience guessing right up until the last frame. It’s a fast-paced thrill ride that barely comes up for air, and when it does catch its breath, it does so only in short, hyperventilating gasps. The making of Solo: A Star Wars Story was almost as dramatic as the movie. Originally, it was to be directed by Phil Lord and Christopher Miller (the duo behind The Lego Movie), but they apparently didn’t work out, because the pair was replaced by Hollywood stalwart Ron Howard (In the Heart of the Sea). The script was written by Lawrence Kasdan (who wrote The Empire Strikes Back, Return of the Jedi, and The Force Awakens) and his son, Jonathan (who wrote for “Dawson’s Creek”), so it was bound to feel like a Star Wars movie, no matter what director was at the helm. And Solo: A Star Wars Story definitely feels like a Star Wars movie. It comes off as kind of a “best of both worlds” scenario, as it’s got all of the slick CGI visuals of the prequels, yet still has plenty of cool practical creature effects. Like any of the post-The Force Awakens Star Wars movies, it’s got its pandering moments, some that forward the story and some that are just tossed in randomly for the fanboys to go “ah-ha!” But that all just comes with the universe. 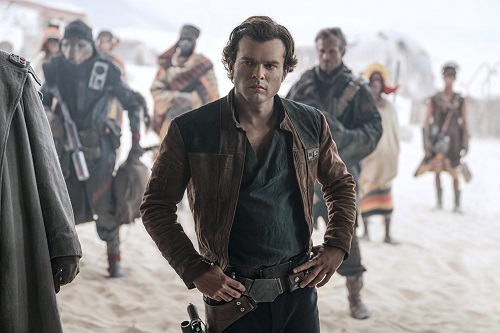 There can be no doubt that, as far as Star Wars is concerned, Harrison Ford IS Han Solo, but Alden Ehrenreich does pretty well as the young Solo, channeling Ford’s legendary performance while still letting a bit of the character’s inexperience and overconfidence shine through. Donald Glover does the same with his Lando, basically playing the role as a young Billy D. Williams version of the character. And Chewie is as Chewie as he’s ever been (and he should never change, period). The other characters, like Qi’ra, Beckett, and Dryden, seem like they could have been pulled right out of Rogue One, beings that fit the universe but aren’t quite as sacred. Star Wars fans are pretty protective of their beloved franchise, to the point of being fickle when offered something new. Some will hate anything that is not The Empire Strikes Back, while others will embrace just about everything that’s put on screen. For this reason, the fanboy reactions to Solo: A Star Wars Story will probably be just as mixed as they were for The Last Jedi and Rogue One. Personally, I have to admit that I’m in the second camp, as I have a soft spot for anything Star Wars and, while I’m by no means a fanatic, I love any movie that puts Chewbacca on the big screen. And Solo: A Star Wars Story does that. As for quality, it’s on par with the more recent Star Wars flicks, not as good as the original trilogy, but way better than the prequels. The music in Solo: A Star Wars Story is brilliant. It’s credited to composer John Powell (who scored the Jason Bourne movies, as well as children’s flicks like How to Train Your Dragon and Kung Fu Panda), but it’s an “adapted by” credit, meaning that most of the score for the movie was adapted from John Williams’ famous themes. Sharp-eared fans will recognize reworkings of Han Solo’s original musical theme, as well as the infamous Imperial March. Even Qi’ra’s theme is very reminiscent of Princess Leia’s old theme. Powell did write quite a bit of original music for Solo, and it all fits right in with the grandiose, triumphant horn-and-string symphonic treasures that every film fan knows by heart. Between the adaptations and the newly composed themes, the music in Solo is recognizable, yet still fresh enough to remind the audience that it’s a standalone Star Wars movie.